This 17 inch quality hookah is an example of modern production applied to an old tradition. It is easy to assemble and disassemble, clean and store, which makes for a great travel hookah. It smokes just as well as its larger counter parts and is very popular among new smokers and seasoned hookah heads around the world. This hookah is an Egyptian configuration that comes with Mitsuba tongs, head, and hose. The hose is 68 inches, modeled after Syrian premium barbishi. 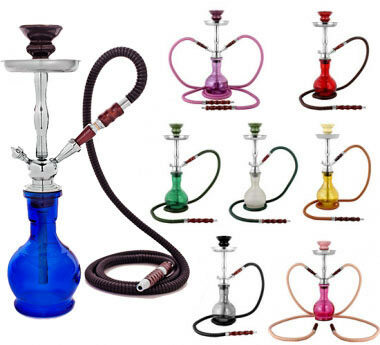 This hookah is available in one and two hose models. 17" Small Premium Hookah has a average rating of 4.2 stars out of 5 stars based on 10 reviews. great first time hookah - the case is great it makes it easy and discreet to travel with - the only issue that i had with it is that the seals are not great - but plumbers tape took care of that! happy hookahing!